The UN’s Sustainable Development Goals, or SDGs, face serious challenges over funding if they are to achieve their objectives by 2030. America’s editor William Dowell writes that a Swiss-backed initiative, Project 1800, could not only solve many of the SDG’s financial difficulties but also dramatically improve the funding equation for other development projects. The new concept shifts the focus to people and mobilizes multiple sources of capital for social ends. “There is simply not enough capital in the current paradigm. We need to reframe capitalism,” observes Arthur Wood, the Geneva-based international development consultant who convened Project 1800. The Swiss Development Corporation (SDC) recently underwrote this unusual initiative in the hopes that it just might provide the answer to financing and achieving the United Nation’s much-touted Sustainable Development Goals. The five-month study takes its name from the fact that an estimated 1,800 children under the age of five die each day from a lack of clean drinking water. The project uses the Senegal River basin as a test case for clean water management, but its implications go much further. WASH (Water, Sanitation and Hygiene) ranks as the second most pressing SDG, surpassed only by climate change. Roughly 3.4 billion people are currently believed not have to access to clean water today. By 2030, the deadline for the SDGS to be reached, clean water access will be problematic for at least 40 per cent of the world’s population, a reality already costing $300 – $600 billion a year. Meeting SDG-6’s (6.1 and 6.2) overall requirements is estimated at $1.7 trillion. As matters stand, the global foundations and international institutions created at Bretton Woods can barely provide $300 billion a year in financing over the next 12 years. That means that the SDG targets for water and sanitation are unlikely to be met. The estimated annual shortfall for achieving all 17 SDGs is put at $2.5 trillion. Financing the SDGs became even more stressful after waves of Third World immigrants crowded into Europe, exhausting humanitarian budgets that might otherwise have gone towards development. A more recent concern is that the world’s financial markets, which are now at their highest level since 1900, are overdue for a correction. If and when that happens, there could be even less funding for the SDGs. Arthur Wood, who was hired through Strategos, a boutique consulting outfit, believes that the current approach to financing the SDGs is fatally flawed and ultimately doomed, unless the entire system is radically reconfigured. Without private investment, Wood insists, the SDGs are essentially non-starters. Wood and the 19 experts from different organizations, such as the UN and civil society, but also former regulators, technology and metrics specialists, spent more than five months developing Project 1800. What they recommend is nothing less than a new financial approach. 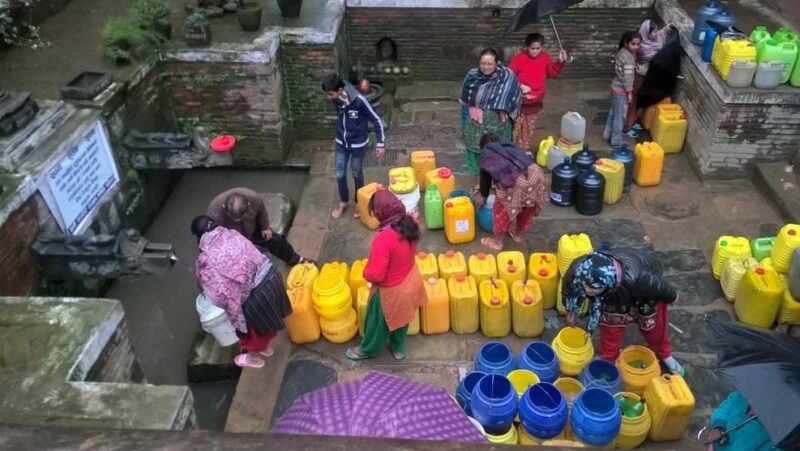 This means a radically new multi-stakeholder model for dealing with basic water problems. The Senegal River Basin, which is shared by four countries ‒ Senegal, Mali, Guinea and Mauritania ‒ served as a concrete example to realistically anchor the project. The principles developed, however, could be applied to most development initiatives. “The issues we are dealing with,” Wood says, “are systemic issues.” The critical element missing from the current approach, he believes, is an accurate assessment of the social cost of failing to meet the SDGs. “Government planning needs to look at the Social Progress Index as well as GNP.” In the Project 1800 model, each dollar invested tracks improvement of all the externalities (In this case, “externalities” refers to the indirect costs incurred if the project were not undertaken). 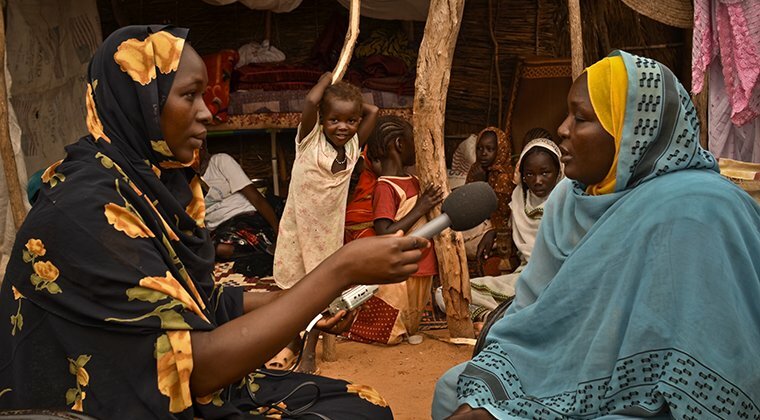 Radio Sila’s camp correspondent, Usna Omar Arabi, (left) makes an interview in Djabal refugee camp. This encourages policymakers and donors to see investment as a condition, and not just a result, of economic development. Even better, once a specific social benefit from a project can be quantified, it may even be possible to market a “blue equity”. In the Senegal River Basin, for example, clean water and a healthy population makes it more attractive for businesses to invest in the region, since the returns from their activities will be higher. This also justifies asking them to put cash into development through a token or share the authorities can create and sell. This is essentially a socially-oriented, outcome-based security that can be bought and sold on the open market. A standard equity security (known as an “Exchange Traded Fund”) would have a value based on both the aggregated economic return of the participants and the economic value of reducing all the future externalities. Local currencies such as the Bristol pound, Basque Euskos and the Léman in the Lake Geneva region are alternative scripts usable only locally to stimulate the local economies. A crypto blockchain startup Civic is pushing the same message through its CVC tokens. Systemic change: what happens if there is no investment? It may sound like an old approach to conservationists. They’ve been practicing multi-stakeholder principles and ecosystem approaches to human development problems for decades. But one major benefit of Wood’s approach is that it brings management vocabulary to bear on development jargon ‒ which private investors have a hard time understanding. As Wood points out, investment banks have employed a similar approach, but with a “client” rather than a “product” focus. Previous development efforts have tended to treat water problems piecemeal as a fragmented market in which incentives were misaligned. Project 1800 aims at a broader network approach. It also plans to introduce the latest financial and communications technology, while finally standardizing the whole procedure. This includes hard wiring the interests of the local communities, social entrepreneurs and social stakeholders in the process. Incorporating private investors into the mix is hardly new. What makes Project 1800 different is its emphasis on developing a overall project framework that can be adapted – and, above all, applied ‒ to vastly different scenarios. The goal is to shift the development model from one that incentivizes competition among different countries, agencies and philanthropies to one based on collaboration and economic value. Marc Owens, former head of charities regulation for the US Internal Revenue Service and now a lawyer with Loeb & Loeb, LLP, points out that groups in the US have been exploring precisely this. Variations on existing legal forms, he says, such as the limited liability company, can provide structures that could facilitate social investment. These could offer participatory tranches of a project designed to produce tailored investment returns. Europe, for example, has pioneered and continues to innovate socially-focused enterprises, from the huge Mondragon worker-owned cooperative in Spain’s Basque region to new business entities, that invest part of their returns into social projects as part of their legal structure. Project 1800’s legal frame is an adaption of global partnership law to social purpose and (as it already does in the Corporate sector). This allows for multiple players to retain their own legal frames but aligning their interest and incentives. When married to an equity structure this allows different economic social returns to multiple stakeholders. A foundation investor may want a high social return, but only a token or negligible financial return. A private investor or a governmental investor, on the other hand, may seek a different combination of social and financial returns. The Project 1800 framework would help coordinate different participants including the community served. It would also help leverage individual innovations while offering quick, replicable frames to facilitate financing. The goal is to emphasize a win-win collaboration among all concerned. This post was originally published online at Global Geneva.